Despite having a degree in print journalism, with digital having taken the world by storm this century I am painfully ignorant when it comes to the history of the print press, especially the British one as I grew up in the Netherlands. However, I am fascinated by the origins of Fleet Street and so Ink, detailing the history of one of the UK's biggest and most popular newspapers, was the perfect opportunity to learn more. What I didn't expect though, was quite how gripped I'd be by this fast-paced drama, which was as brilliant in its writing as it was in its execution. Younger generations may only know The Sun for its Page 3 controversy a few years ago, but there is a riveting backstory to this British newspaper growing from underdog to populist tabloid under the helm of Australian media mogul Rupert Murdoch and editor Larry Lamb. 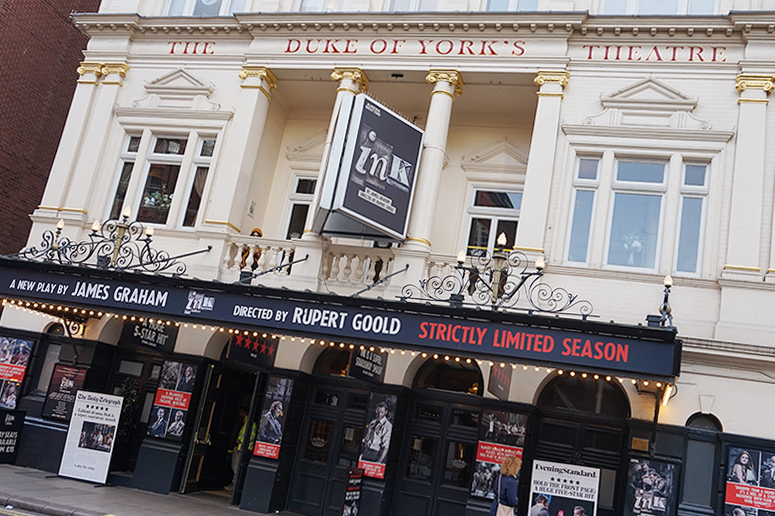 Writer James Graham and director Rupert Goold have turned the origin story of the national daily into a fast-paced drama that after a sell-out season at the Almeida Theatre has received a very deserving transfer to the Duke of York's in London's West End. 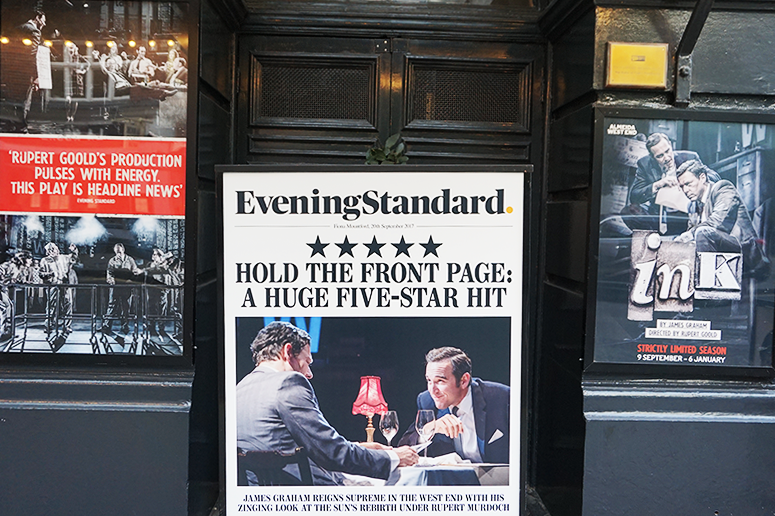 The play opens with the first meeting between Murdoch (Bertie Carvel) and Lamb (Richard Coyle) in 1969 and follows in their footsteps in the first year of the paper under the new direction, with the ultimate goal to overtake the much more popular Daily Mirror in sales. They assemble a very reluctant team around themselves and rapidly cause a revolution on Fleet Street. Through focusing on what the average lower class citizen is passionate about, including television which traditionally was seen as a rival to the print press, they rally the masses and gear up to make the impossible possible. I was only vaguely familiar with the history of The Sun, and the British press in general, and so discovering the origin to Page 3 and the lengths to which Lamb and Murdoch were willing to go to prove themselves were eye-opening. Both came across sympathetic at the start of the journey and while Lamb more noticeably descends into madness into Act 2, Murdoch's ruthless business choices hover on the sidelines too, showing a highly intelligent man who plays Lamb like a ventriloquist doll. It was hugely captivating to see their dynamics unfold and both Carvel and Coyle were absolutely superb in their respective roles, commanding the stage in each scene they were in. Their intensity was balanced well by the more lighthearted antics from the wider editorial team, most noticeably the sports editor who goes from merely reporting the scores of a match to having to write in-depth features, and the deputy editor who has to put his principles aside to include text printed at a 'scandalous' angle that would never have gotten through copy edits at his previous place of employment. At 2 hours and 50 minutes in length, Ink is not a short play but not once did I feel that the actors were outstaying their welcome or did I check the time. Both acts are extremely fast-paced, delivering witty and often surprisingly funny dialogue at high speed while rapidly moving the story along and going from one shocker to the next. In the age of digital, I didn't think the history of one of Britain's most controversial print publications starting as long ago as the 1960s would have much of a standing but I I was wrong. The debates surrounding The Sun's change in direction are still very prevalent today, creating not only a gripping piece of theatre but a thought-provoking one too. Many thanks to Official Theatre for inviting me to see the show in return for an honest review. Ink is playing at the Duke of York's until 6 January 2018. Book your tickets here.